Sitting in replendent isolation on the lava plains of Mare Nubium, the magnificent 61 km Bullialdus reflects the early morning sunlight strongly off the steep cliffs ringing it’s western rim. If you were to stand on this precipice next to this face, a nervous downward gaze would reveal huge islands of collapsed rubble nearly 1800 meters of almost vertical drop below you. Wrapping around in great arcs with your field of view, on the opposite side of the crater, these giant terraces would appear as tumbled foothills rising from a deep gray plain, interrupted by the brightly lit jutting central peaks of Bullialdus. The wreath of folded crust that forms the glacis of Bullialdus is one of it’s most alluring aspects. It seems replete with craggy flows of broken crustal rock arranged radially around the outer rim. As an Eratosthenian aged crater, little is preserved of this iconic crater’s once prominent ray system, but at one time it must have been quite a sight, powdery rays splayed across the long cooled Nubium flows. But time, sunlight and micrometeorites fade everything. 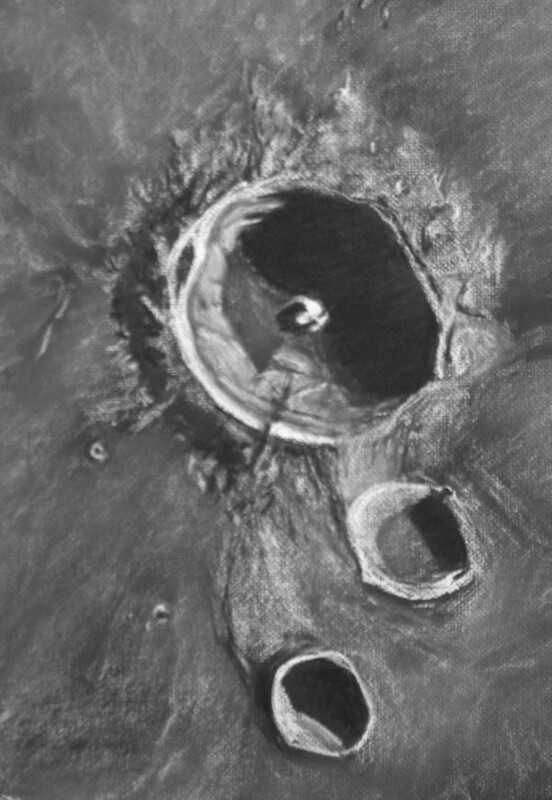 Craters like Bullialdus are classified as complex craters. The force of the impact of the original asteriod is strong enough to distort the surface downward a few kilometers. In response to this compression, the surface rebounds almost explosively, creating extraordinay results: central peaks and rim terrace mega collapse slides. Bullialdus’s peaks are close to 1000m high. The annulus of mass wasting, especially in a couple of areas to the south west of the floor do appear to almost encroach on the central peaks. To the south of Bullialdus is Bullialdus A. There seems to be a scooped depression that connects Bullialdus to it’s diminutive neighbor, as if the shock of A’s formation created a landslide off this section of the glacis of Bullialdus. Futher to the southwest Bullialdus B echos this odd terrain. Medium: White and black Conte’ Crayon on textured black Strathmore paper. It is always with great pleasure that I look upon your beautiful lunar renderings. Your ability to capture the textures and details is unmatched among sketchers. Words just can not describe the exceptional sketches that we see from you time and again. Just absolutely magnificent!